Outburst Theatre runs community performing arts projects on large scales, as well as offering workshops to schools and community groups. 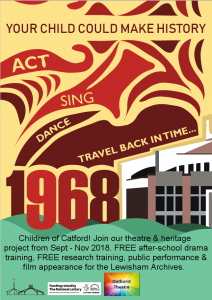 Partnered with St Laurence Church & Community Centre (Catford) and Blackheath’s Age Exchange, Outburst Theatre brought together 35 children in Years 5 & 6 from 12 different Lewisham schools and dozens of senior residents who shared their memories of life in Lewisham and Catford in 1968. The children then used these stories to create an immersive, promenade performance, in the vast and unique space of St Laurence Community Centre. This project gave free drama training and free research training to all participating children. A documentary was made of the whole process, which will be screened at St Laurence Community Centre at the end of February, 2019. Audio recordings were made of the children interviewing senior residents and 20+ hours of recordings have been donated to the Lewisham Archive for future research on local life in the 1960s. This project was funded by the Heritage Lottery Fund, Outburst Theatre, St Laurence Church and Lewisham Arts Council Fund. 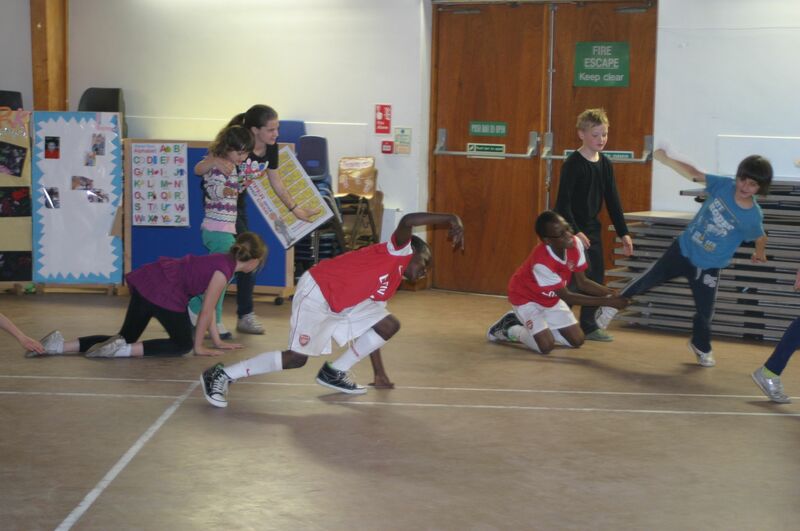 Comic sketches and dance theatre on the theme of charitable giving, tied in with refugee crisis awareness, performed to St Laurence Church congregation. 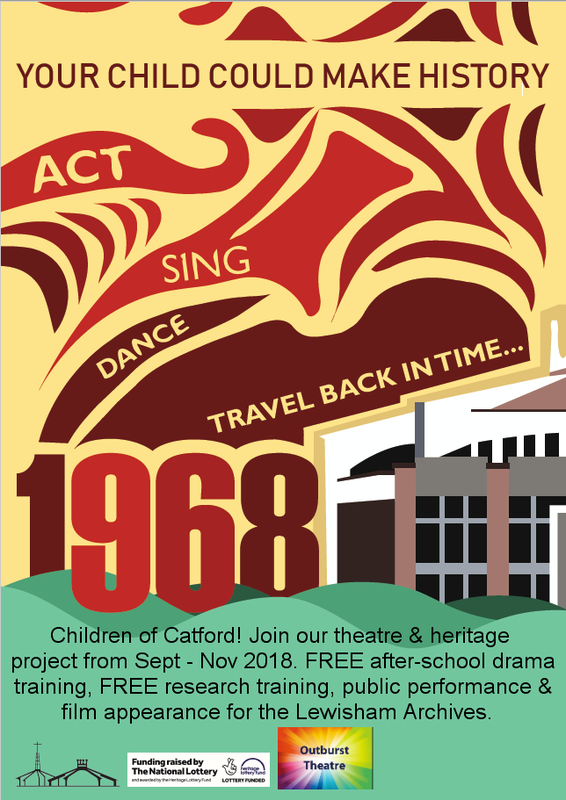 Community theatre project based on themes of immigration, politics and religion in Catford, 1968. Live promenade theatre performance. Funded by Rushey Green School. 1 week of drama, dance and song workshops for young carers, leading to a cabaret showcase performed to parents, funders and the Mayor of Bromley. Staged, interactive storytelling, with Marian Mission Youth Centre, performed by children aged 5 – 11 years to parents, teachers and funders. Live theatre in St Laurence Church, celebrating Mothering Sunday, performed to local congregation. Musical theatre show with Marian Mission Youth Centre, performed by children aged 5 – 11 years to parents, teachers and funders. Marian Mission, Leyton, London – 2010Musical theatre show with Marian Mission Youth Centre, performed to parents, teachers and funders. Bespoke workshops tailored to the books or subjects you’re exploring with students. Let us know what you’d like us to bring to life for you! Examples of previous workshops include: Shakespeare’s “The Tempest”, Roald Dahl’s “Matilda”, “Where the Wild Things Are” & Animalympics. Hula hoop workshops for all ages and abilities. Be as silly as you’ve always wanted to be! Learn slapstick techniques, double-acts and how to develop your inner clown. Students develop excellent focus and co-ordination through this highly enjoyable, artistic practice. Public Liability Insurance: All workshop leaders have full individual Public Liability Insurance and Outburst Theatre has company Public Liability Insurance. Qualifications: All workshop leaders are professionally / degree qualified.